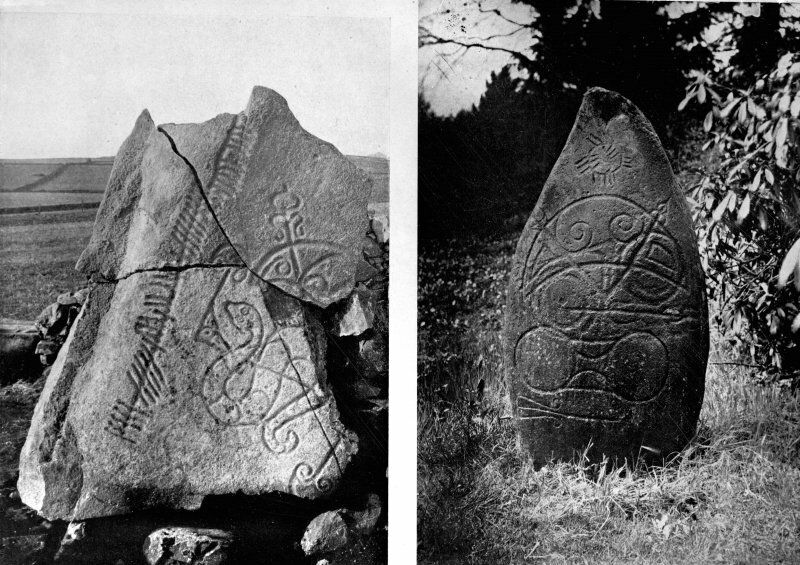 View of of the Brandsbutt and Logie Elphinstone symbol stones with ogham inscription. View of reassembled fragmentary symbol stone. View of symbol stone built into stone dyke. Original half-plate glass negative captioned: 'Sculptured Stone at Brandbutt Inverurie 1902'. No month given but presumably December. 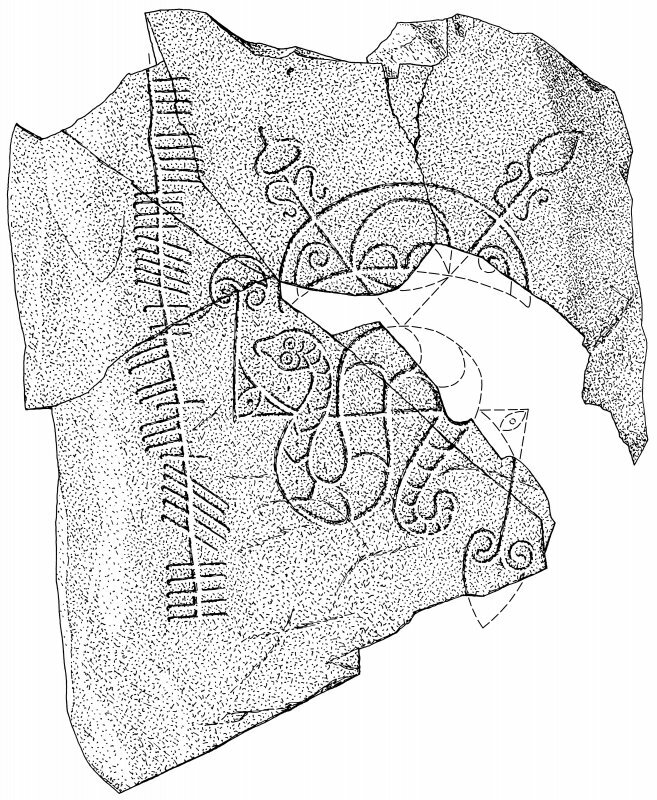 Brandsbutt, Inverurie, composite digital image of rubbing of an ogam-inscribed Pictish symbol stone. View of face of Brandsbutt ogham inscribed Pictisy symbol stone. 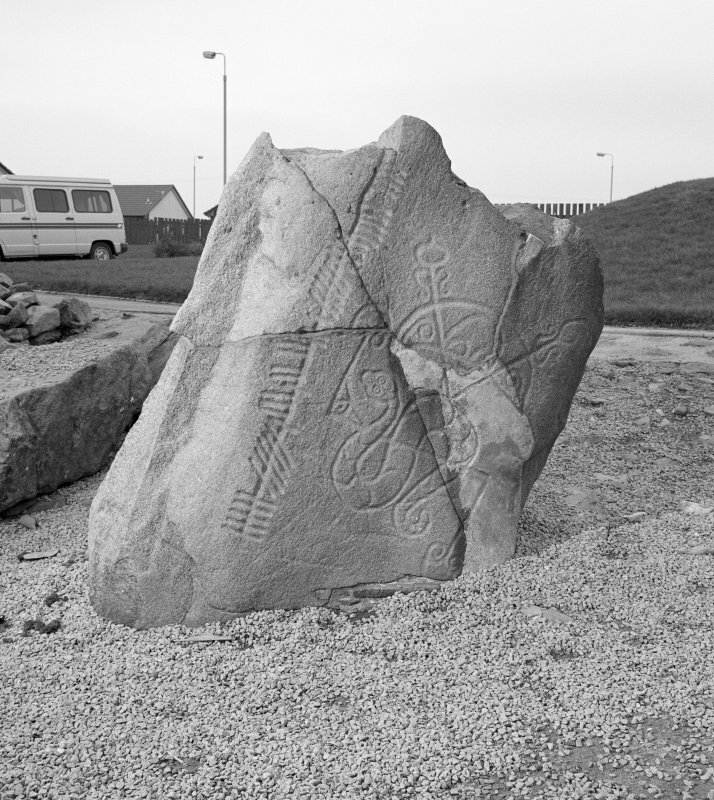 View of of the Brandsbutt symbol stone, Inverurie, showing the ogham inscription. View of of the Brandsbutt symbol stone, Inverurie. 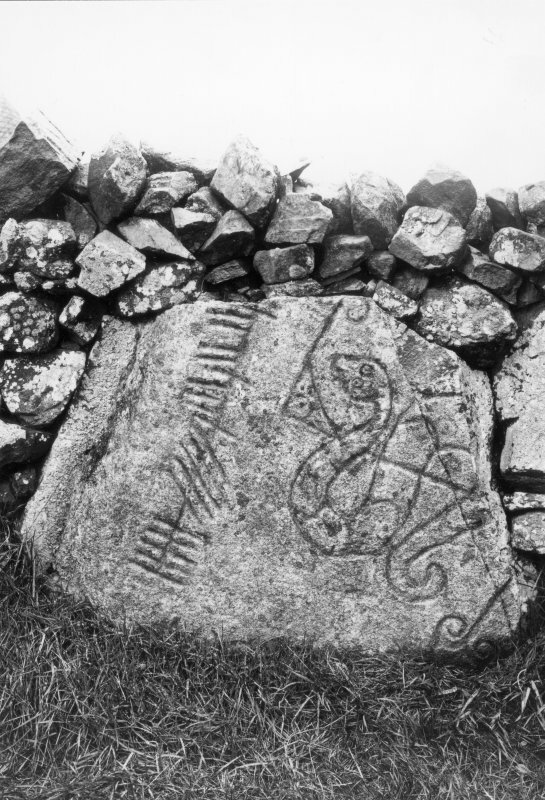 Detail of Brandsbutt ogham inscribed Pictish symbol stone showing a serpent, Z-rod and crescent symbol. 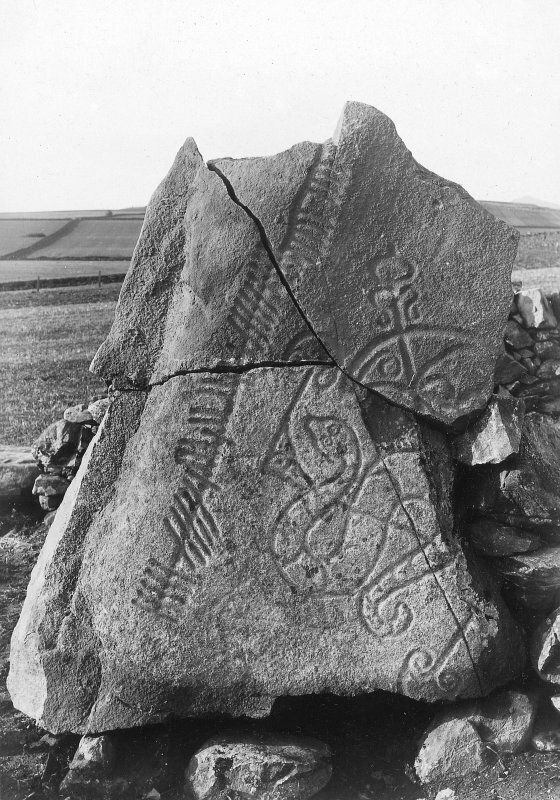 Brandsbutt, Inverurie, Pictish symbol stone. View from SE, dated 12 Sept. 1995. The stone is as described above. 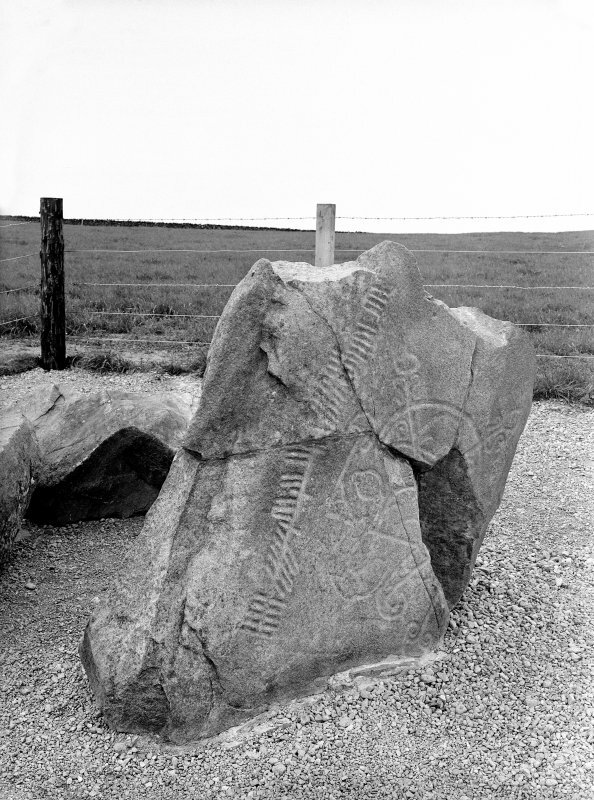 The Class I sculptured stone at Brandsbutt, which measures 3 feet 6 inches high by 4 feet 2 inches wide by about 3 feet thick, bears symbols and an ogham inscription. The Brandsbutt Stone was broken up to build into a field dyke, but the pieces have now been put together. V G Childe and W D Simpson 1961. 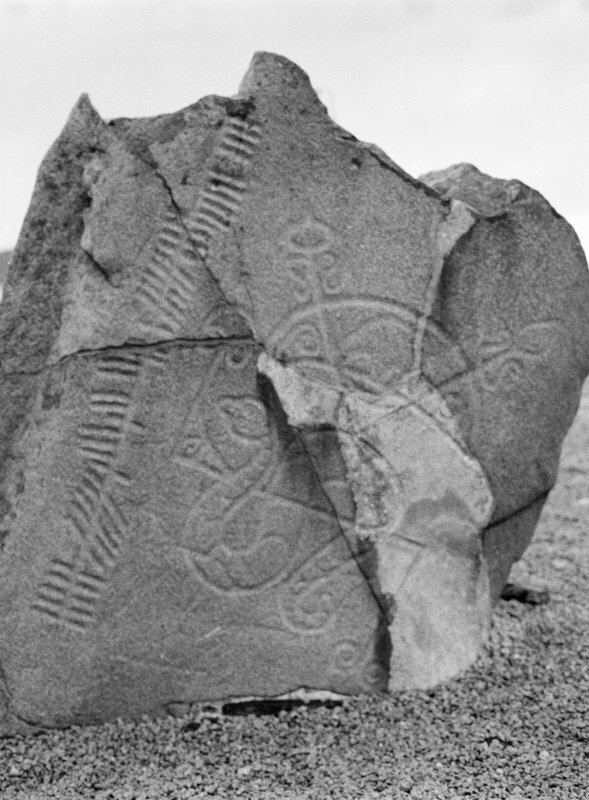 The Brandsbutt Class I stone is decorated with a cresecent and V-rod and a serpent and Z-rod symbol, both incised, as well as being marked by a line of Ogams which are certainly contemporary with the symbols. It is a matter for regret that this stone was broken and partly lost in the past; and for congratulation that the remains have now been reassembled and are under guardianship. 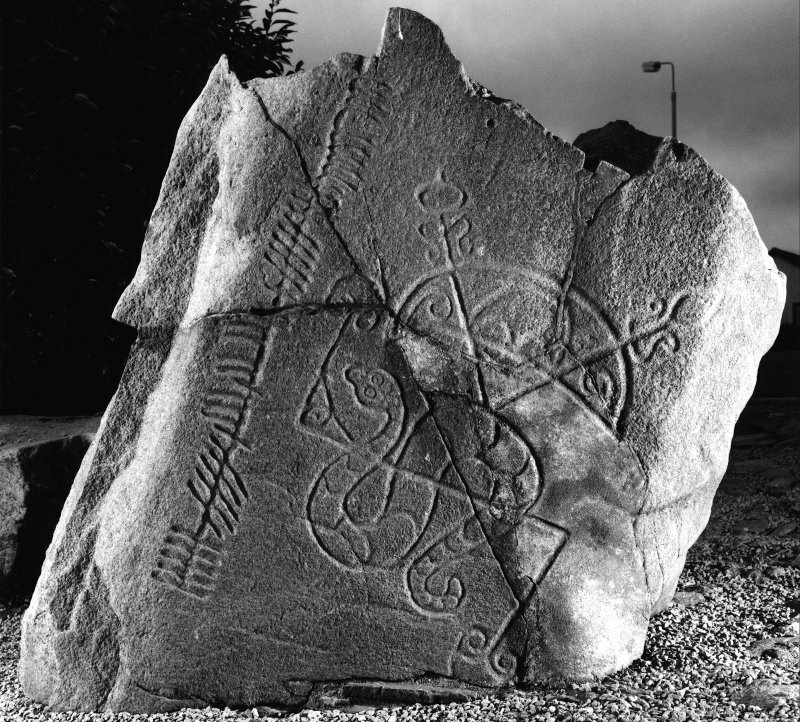 A symbol stone of dark whinstone, 1.06m x 1.27m x 0.91m bearing a sepent and Z-rod, and crescent symbol. 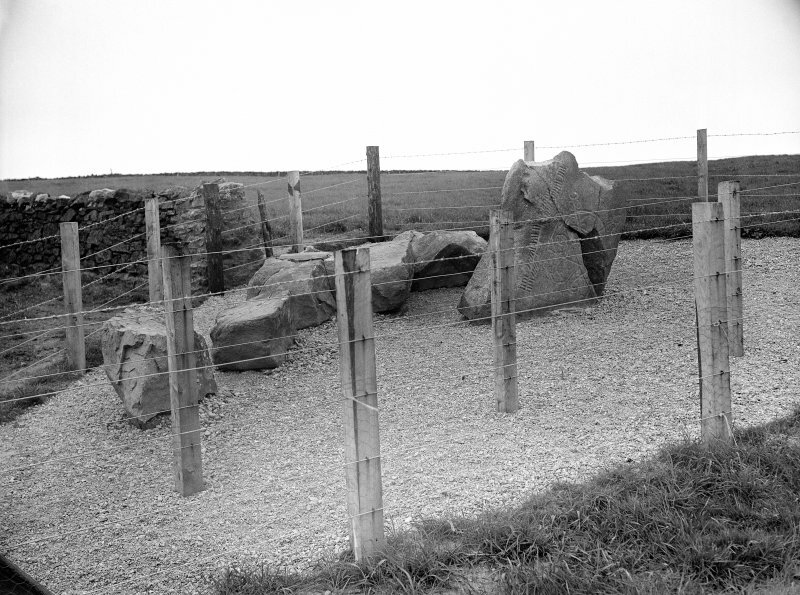 The stone once made up a field-dyke but has now been pieced together, to reveal an ogam inscription. Field visit by Grampian Regional Council archaeologists. (GRC/AAS ground photography listed). NMRS, MS/712/72, visited December 1982 and 23 August 1990. A great, grey slab, once broken up but now restored, bearing an incised crescent and V-rod, a fine, scaley serpent and Z-rod with simple terminals, all carved in a broad confIdent line. Running up the left hand side of the stone is a typical Pictish ogam inscription in which the guide-line has been drawn in. It can be transliterated IRATADDOARENS, which may be similar to the Newton House stone (N] 662297) IDDARRNNN. This has been linked with Eddarrnonn, a possible rendering of St Ethernanus. It reinforces the interpretation of the symbol stones as some form of personal memorial. The stone is adjacent to the site of a stone circle, now marked out in the grass. 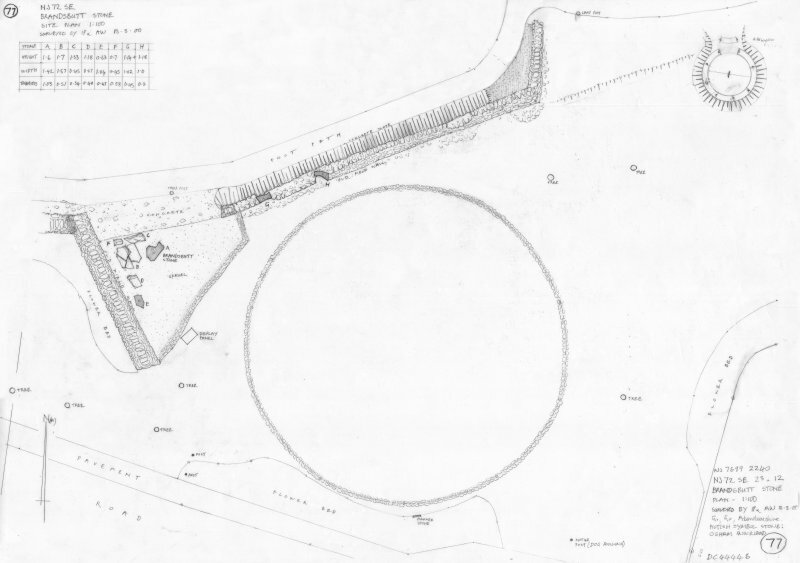 Field visit by Aberdeenshire Archaeology Service. (GRC/AAS ground photography listed). NMRS, MS/712/72, visited 23 August 1990. A great, grey slab, once broken up but now restored, bearing an incised crescent and V-rod, a fine, scaley serpent and Z-rod with simple terminals, all carved in a broad confident line. Running up the left hand side of the stone is a typical Pictish ogam inscription in which the guideline has been drawn in. It ca n be transliterated IRATADDOARENS, which may be similar to the Newton House stone (N] 662297) IDDARRNNN. This has been linked with Eddarrnonn, a possible renderin g of St Ethernanus. It reinforces the interpretation of the symbol stones as some form of personal memorial. The stone is adjacent to the site of a stone circle, now marked out in the grass; two of the stones of the circle survive in the drystone dyke to the N.
Class I symbol stone : crescent and V-rod over a serpent and Z-rod with an Ogam inscription on the left.